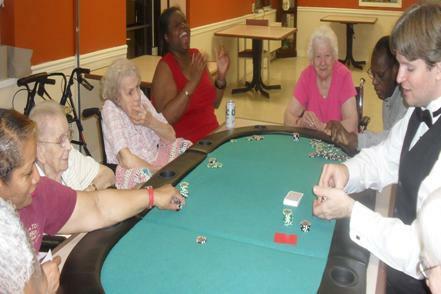 The Senior Poker Club strives to create a fun and exciting event that engages our clients in a thought-provoking manner through poker. We do this by employing professionally trained dealers who can teach poker in a warm-hearted and patient manner. We use the best casino quality equipment to give an authentic feel to the game. We strive to keep this at a price that will allow us to connect with our clients on a continual and frequent basis. The Senior Poker Club has booked it's 6,000th event! Thank you to all of our customers and great dealers who made this possible.